Make every occasion special and unforgettable with the perfect taste of chocolates and nothing can be more romantic than sending your lover a box of exotic heart shape chocolate. 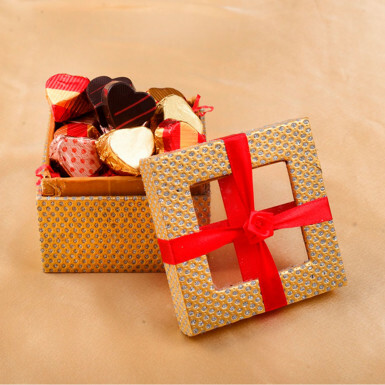 Combine this chocolate box with any product to make a fantastic gifting hamper. Add some sweetness to the life of your beloved ones with our exotic chocolates. Order online delightful chocolate gift box to melt the heart of your loved ones and make them feel super special. This elegantly designed Jewellery window box is filled with an assortment of heart-shaped classic chocolate truffles, almond, butterscotch, nougat crisp, heavenly milk, bittersweet dark chocolates.